In addition to tracking work time, your team can also track vacations, sick leaves, and other PTO stuff with Clockify. All you have to do is create a project called “Time off”, make it public, and then people can log their vacation days by creating 8h-long time entries on the “Time off” project. Then, in reports, you can track who is away on vacation, calculate how much time someone used up, etc. On one hand, you have small companies that use Excel/Google Sheets to track vacations. On the other, you have big organizations that use extremely complicated payroll and PTO tracking software. There’s nothing in the middle. If your team already logs their work hours in Clockify, they can also use it log their time off, thus being the optimum vacation tracker solution for everyone who’s not a Fortune 500 company. By tracking both work time and time off in Clockify, you’ll have all the time data in one place, plus make PTO management and balance checking super simple. If someone wants to take more than 1 day, they can create multiple entries for each date they will be absent. To make the process quicker, they can log time in the Timesheet. Management and HR can run time reports and see who’s absent and when. If you need to differentiate between different types of time off, you can create tasks for each type: vacation, family leave, sick leave, sabbatical, half-day, etc. 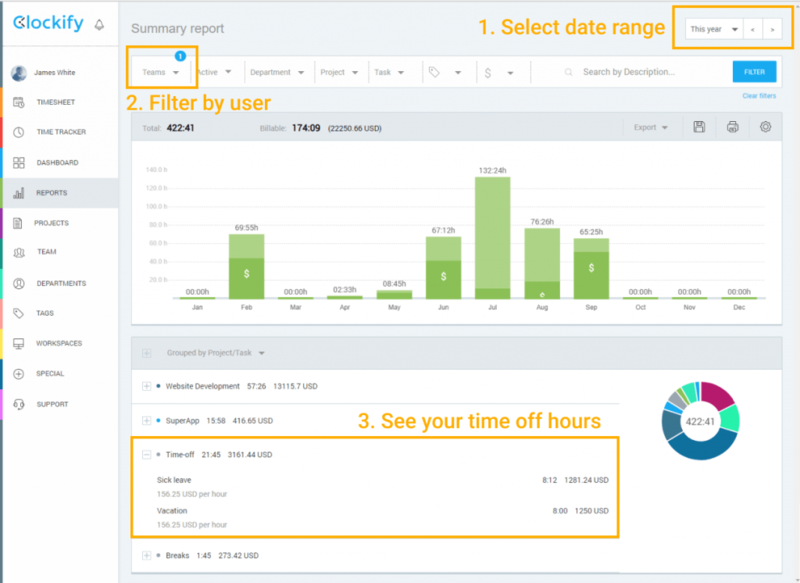 Then, when a person logs time off, they can be more specific and you can have more granular data in reports. If someone decides to cancel their vacation, they can simply delete the entry. Or, even better, notify the manager about the change so the manager can delete it for them. How to track unpaid leave in Clockify? It depends on whether you use hourly rates or not. If you calculate payroll with Clockify, then a person can just mark time entry as non-billable. 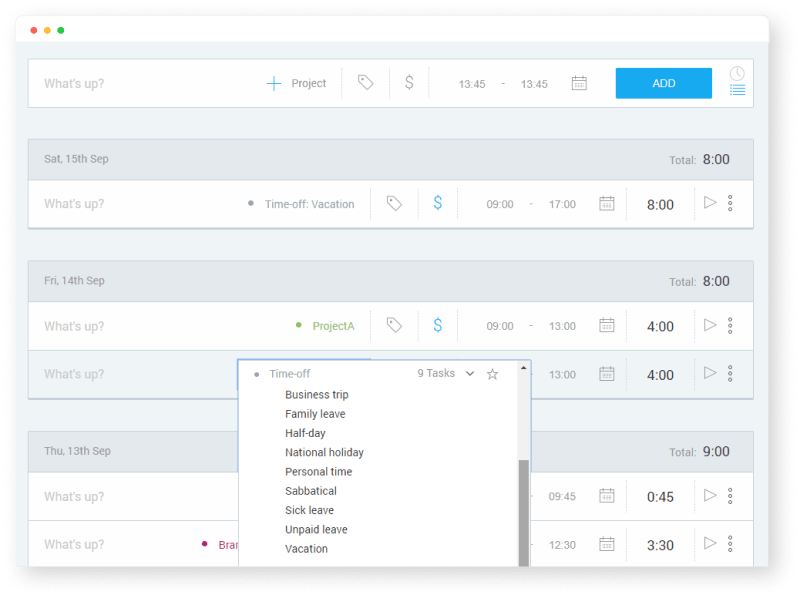 If you use Clockify just for time data, then you can either create a new project for unpaid leave or create “Unpaid leave” task in the “Time off” project. Another option is to use a tag. How you’ll track unpaid leave will depend on how you organize your data and use reports. If you want to differentiate between paid and unpaid leave in the Weekly report, create a separate project. If you want to see all absences in one place, use tasks to differentiate between different types of time off. Most workplaces have paid 30min lunch breaks. You can account for them in the same way as time-off – by creating a time entry. Only in this case, it might be a better idea to put all the breaks into a separate project, so they don’t get mixed up with whole time-off days. Another option is to create a “break” tag. Employees can create a 30-min time entry, leave it without a project, mark as nonbillable, and attach “break” tag. 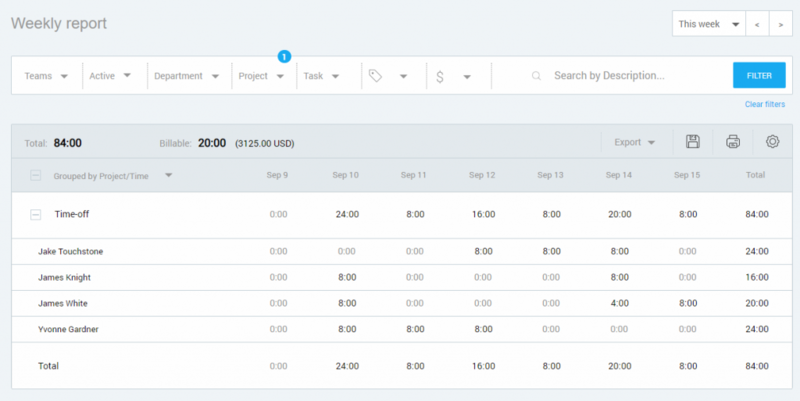 Later in reports, you can filter out entries with the “break” tag to calculate payroll or billable hours. Clockify is a simple time tracker and doesn’t have PTO approval feature (which makes PTO tracking software so complicated and difficult to use). Instead, people log their time off and managers only have to do something if they don’t approve the time off. If you set “Who can see entries on public projects” to Everyone, your whole team can see who’s out of the office at any time. Management and HR can run the Weekly report at any time and see who’s out of the office that week or some other week in the future. When planning time off, your team can check how much vacation days they have left. All they have to do is run a Summary report and filter the data by “Time off” project. They can see how much time they’ve logged for time off and divide it by 8 to get the number of used-up vacation days. If your team can work overtime and accrue days off, they can use Clockify to track their overtime work hours and attendance. If people have a specific number of hours they need to log each day, you can set targets for them and Clockify will remind them to log their time if they forget. Also, you can set a reminder if someone goes over their target. Not all workers fit a nice 8h/day template. Dedicated PTO trackers need to account for all the possible workflows and have hundreds of rules and codes, which make them bloated and difficult to use. Clockify is simple and flexible. If someone worked half a day and took a half day off, they can just log 4h for work and 4h for time off. Same with temp workers. 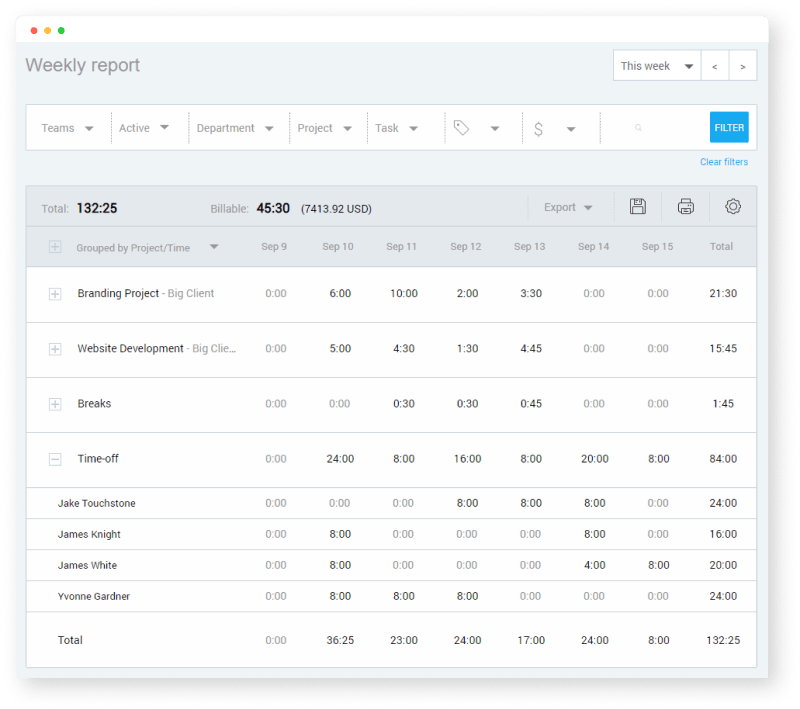 If people have irregular work hours and accrual rules, all they have to do is log their work hours, and then calculate PTO in reports on a as-need-to-know basis.